Accessories are always important to help keep you and your instrument in the perfect playing condition. Forté Music carries accessories for every instrument, from valve oil and reeds for the band to rosin and Kun shoulder rests for the orchestra. 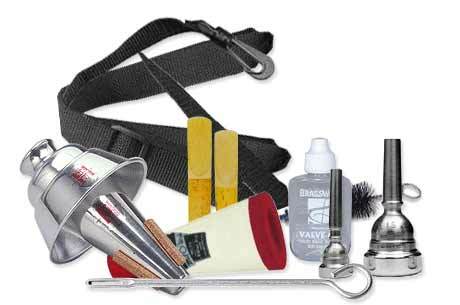 Care Kits are also available with everything you need for most instruments, complete with cleaning tools and supplies for daily upkeep, not to mention detail specific instructions. In addition to instrument accessories, Forté Music also carries Manhasset stands, Hamilton stands, Humes and Berg mutes, metronomes, tuners, guitar and drum accessories, twirling batons, directing batons, and much more.